Selling polished, certified diamonds at the very best prices on the market! 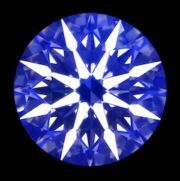 The quality of the cut depends on how much light is reflected from the inside out, the so called sparkle. Scale determines the colour of the diamond from pure white D to the yellow Z.
Determines the carat weight. One carat is 200 milligrams. Scale determines the degree of symmetry of the diamond cut. The polish is light reflected from the surface of the diamond and is also scaled. It determines the fluorescence effect under black UV light. 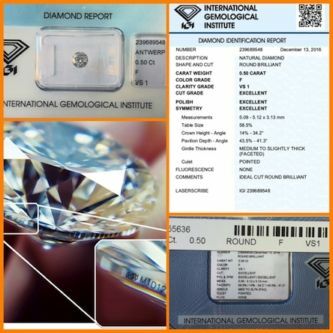 The certificate is like a diamond birth certificate and is issued by independent diamond assessment laboratories. We offer certified polished diamonds. Choose a diamond by parameters or by the price you‘re willing to invest. We‘ll try to find the best option and send you the offer. If you make a custom ring and insert a diamond from us, you‘ll save a lot of money. If you buy a finished ring from a jewellery store, it will definitely be overpriced and the diamond will be a lower quality, e.g. the 0.5ct ring will cost you around €2,800 at the jewellers, while the diamond is worth €1,300 and the price of gold with the work is €200-300. So you save over € 1,000. We sell diamonds at wholesale prices. Our price is consistent with the current international diamond stock price list. We sell diamonds from 0.3ct and higher. All diamonds are at the supplier's disposal and are in their possession. Clarity divide into 11 degrees: FL-Flawless, IF-Internally Flawless, VVS1 a VVS2-Very Very Slightly Included, VS1 a VS2-Very Slightly Included, SI1 a SI2-Slightly Included, I1, I2 a I3-Included. Cut, polish and symmetry are evaluated as Ideal, Excellent, Very Good, Good, Fair, Poor a Unusual. Fluorescence has 7 degrees: None, Very Slight, Faint, Slight, Medium, Strong a Very Strong. Polished diamonds are a safe investment and isn‘t subject to inflation!! If you already know what diamond you would like or how much money you want to invest, we‘re willing to advise you. Diamond 0.41ct, H, VVS1, EX EX VG, fluor. NONE, sealed with IGI cert. Diamond 0.41ct, F, VVS2, 3xEXCELLENT, fluor. NONE, IDEAL CUT ROUND BRILLIANT, sealed with IGI cert. Diamond 0.90ct, D, IF, 3xEX, fluor. NONE, sealed with cert. Diamond 0.71ct, I, SI1, VG, 2xEX, fluorescence NONE, sealed with cert. Diamond 1.00ct, color D, clarity IF, cut EX, symmetry VG, polish EX, sealed with IGI cert.